The garden lizard that I shot, while it climbed on the Neem tree, in front of our home, doesn’t seem to be the same (in the picture below) I encountered earlier. 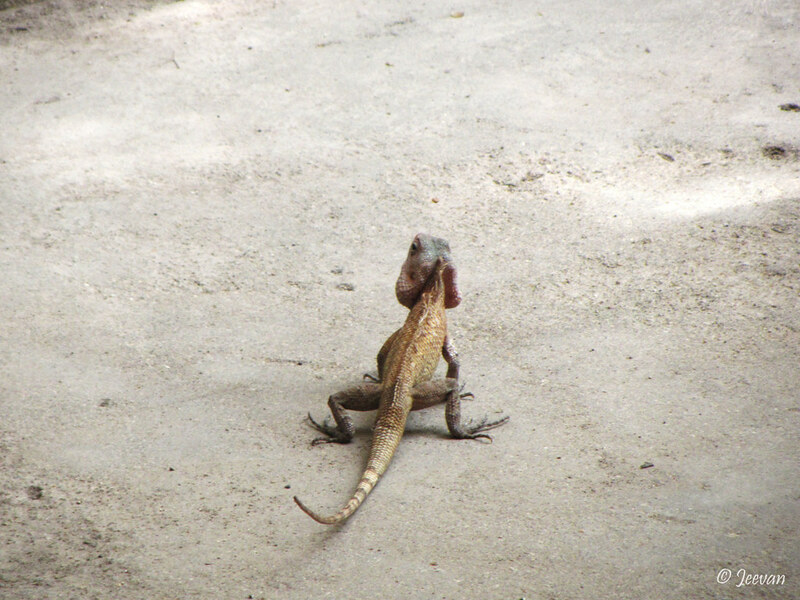 I saw a garden lizard in the courtyard few months back and while I was watching it, another came from a direction and both started to fight each other. Standing on the rear legs, and in the support of their tail they clashed using their front limbs. I was quite amazed at the sight as I never seen garden lizards fighting. Not liked to miss the chance, I rushed inside to take the camera but when I was back both decided to separate and moved on their way and I could only shoot/focus on one to let other escape. During the childhood, when visiting the village I have seen boys trying to catch the garden lizards along the fences, using a knot at the end of a thin stick and try to fasten the neck of the lizard... though I haven’t seen one being caught by them, I find it memorable. It is also fun to watch the garden lizards doing push ups like men work out at the gym – a study say that lizards doing push-ups mean display of strength and indication of get out of my territory. P.S. The northeast monsoon is here, the earth becomes cooler and moister in weather. Downpour in Chennai makes us all feel happy and cheerful due to the showering. That lizard looks fierce! I hope no one can catch him. Well he is a handsome guy. Have a lovely weekend. 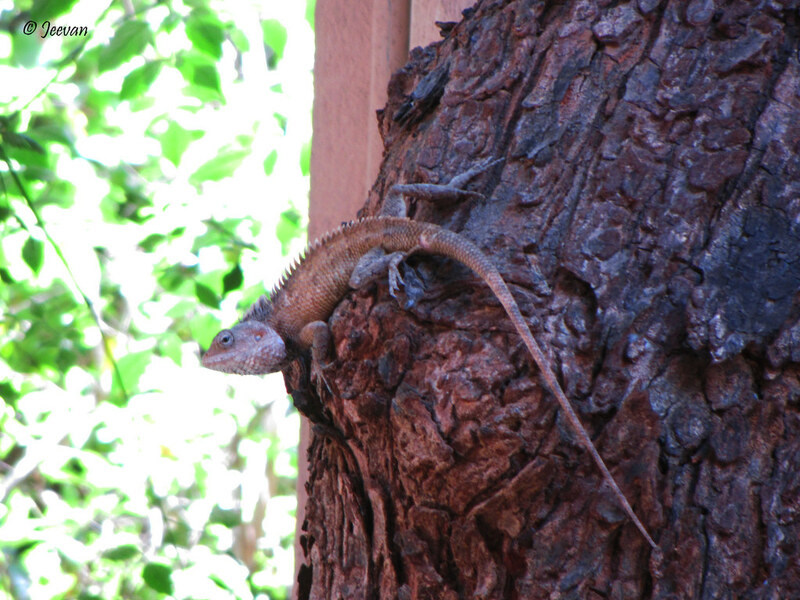 Wonderful shots of the lizard on the tree. wonderful lizards! very cool. enjoy the rains! hope all stay safe! Very cool lizard shots! We don't have any like yours, but ours do pushups, too. So fun to watch. Wow, cool lizards. I love them :) But not when one becomes struck in my bathroom and I am faced with the task of safely guiding it out! PS: The second pic is good. Good pictures.But lizards of all varieties are my bete noire! Wonderful lizards! Great captures of them! Glad the rains are coming for you. Great pictures of the lizards. They look like they'd be pretty tough! A wonderful shot of the lizard on the tree. Do they change color to that of their background? This one sure did blend in with the tree.